CUT! Costume at the Cinema made its debut at the Arlington Museum of Art last weekend, boasting 43 costumes that represent five centuries of fashion and dress. And let me tell you, it’s all gorgeous. Even if you haven’t seen any of these movies, you’ll be able to see artfully recreated styles from the past 600 years of fashion and decadence. 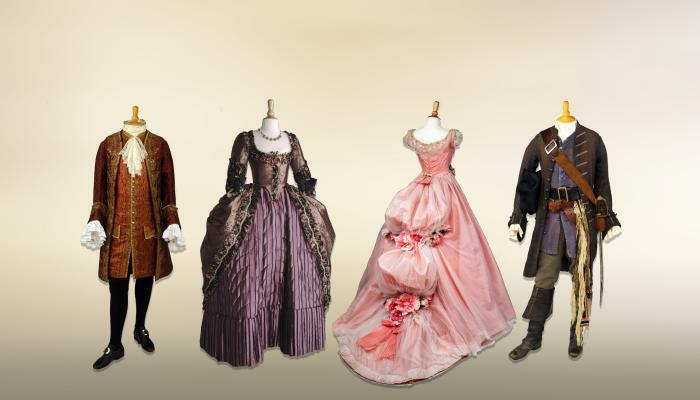 Not only that, they have scenes and trailers showing on the museum’s theater section to see these costumes in action. This is most likely the first costume you’ll see upon entering the exhibit. This dress is GORGEOUS in real life, perfectly crafted from velvet, golden thread and metallic fabrics. From the jewelry selection to the layers and the TRAIN (the train!) you’re teleported to ye old school England. We heard that it took three people to lift and situate, and we can only imagine how great Anjelica’s patience was while shooting her scenes—it probably helped her be extra nasty in her role as the evil stepmother to Drew Barrymore’s Cinderella character, Danielle. I LOVED the Joel Schumacher’s Phantom of the Opera and was so excited to see the detail that went into this 19th century style dress. Adorned with gorgeous full flowers on the bustles and gilded out of the sweetest pink you can think of; this gown was one of 300 costumes created by Byrne and her team especially for this film. Possibly the best dressed gentleman in the room, Heath Ledger’s Casanova costume is ornate, and designed out of woven silk designed with paisley and gold lace throughout. In this time period, men wore tights and a slight heel, but one of the things I really love about this is you can see how tall Health Ledger actually was. This is a favorite of many people –and rightfully so! I want to get married in it. Strapless, bright red and with a train fit for Scarlett O’Hara (or Anjelica Huston [see number one]), this beautiful gown is reminiscent of the 1800s to me, but with a modern strapless twist. This dress looks like disco to me and I love its metallic reimagining! One thing that always impresses me about period pieces is that oft time the designer gets full artistic license to reimagine conceptually classic designs with modern fabrics and colors, adding a splash of anachronism to period pieces. This dress screams 1800s in its cut, pleating process and silhouette, and the metallic fabric is just a creative device to elevate Gertude within the story and visually. I love this dress because it reminds me of Kate Winslet in Titanic. I really love Victorian times because of the incredible depth of beading and decoration on the dresses. I also really love the statement jewelry – how simply but elegant it made the women of era look. The second best-dressed man of the exhibit was the dark-hued late 19th century Sherlock Holmes. I love the mixing of the textures and patterns, and I love how this Sherlock Holmes is more bohemian and stylish than his typical portrayal in books. Out of all of them, I really love the 20s, the loose dresses and the gorgeous hair and jewelry. This dress also reminds me of a modernized version of something Kate Winslet’s Rose in Titanic would wear about a decade later. It’s self-conscious and high society, just like Clarissa Dalloway. I love the cut and actually want this leather jacket, which was specifically made for this movie as it chronicles the life of a Jewish resistance fighter in World War II. At the beginning of the film there’s a clean version, then it gets weathered – fast. How’d it get rugged, you may ask? By wetting, drying, “scrunched up in a dark place” and sanding the thing till it looked lost in the forest for about a year. The entire setup is absolutely gorgeous, and from far away and even more apparent up close, you can see how much work and individual detail things used to be made with back then, and how much attention to detail is used to transport you, through period cinema, to a different place in time. Tickets for CUT! Costume at the Cinema are $10 for adults and $5 for seniors and students. The exhibit runs through August 12th. Visit arlingtonmuseum.org for more information.